This may be bigger news for someone like myself who lives in the DFW Metroplex but still it could be noteworthy to others that want to possibly make a trip to Dallas in the future if the news is true. Steve Davis is reporting this morning that the World Cup bids for the US in 2018/22 could see the final match be played at the new Cowboys Stadium in Arlington, TX, outside of Dallas. The fact remains that Jerry Jones built a mega stadium down here in the Big D and the folks at the USSF have easily noticed. Hell its hard to not notice that stadium out there. You can see it from miles away on a clear day here. It mainly comes down to money. LA and New York…and even Chicago are a tad sexier than Dallas as a whole but when their stadiums won’t come close to holding what Dallas’ stadium will you have to consider it. If you could pack 100,000 folks into a stadium with pretty much all good views of the field for a World Cup final instead of just 80,000 like in other stadiums, the money loving USSF would easily take the 100,000 seat stadium any day. A couple things could stand in the way for Jones’ lovely spaceship of a stadium though. The standing room only seating and the width of the field are biggies on FIFA’s mind. If neither issue gets resolved you won’t see the final played in Dallas. Still the thought of a World Cup final in Dallas has me excited. I know the tournament will come here in one of those two World Cups that the US is bidding on here. But a World Cup final is really cool to think of here. That would easily get the locals excited. Never in Dallas. Quarterfinals for sure, along with Miami, New York, Los Angeles. Semifinals in LA and Chicago. Final in New York. Round of 16 in Seattle, Houston, Boston, San Francisco, Miami, Washington DC, Philadelphia and Denver. 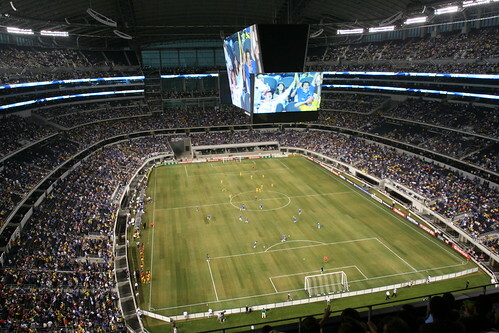 If the final was at Cowboys Stadium, then the final would be in Arlington, TX. There is no way the city would let it go on record as being in Dallas after they are already in a stink over the MNF game where the stadium being in Arlington was not mentioned. Gulati already stated the Final would be at the new Giants Stadium.